So... is it too late to change my vote? When The CW announced a potential Vampire Diaries spinoff in January, I argued that it was a desperate measure by a desperate network. It would dilute the TVD brand, I figured. It would be too much of a good thing. Or too much of the same thing, really. Granted, the segue into this week's backdoor pilot wasn't exactly smooth. 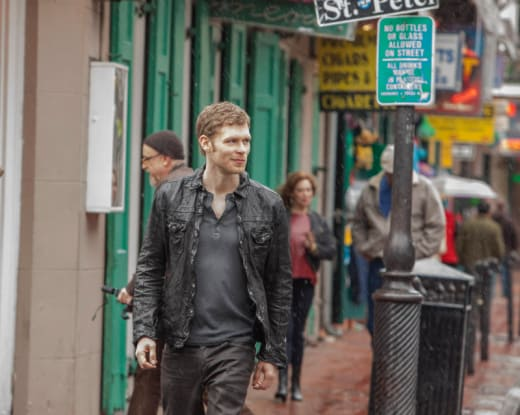 Katherine's note at the conclusion of "Pictures of You" was fairly random and the first half of this episode felt as if we were dropped into New Orleans for no reason related to Mystic Falls at all. But Plec clearly had a plan all along. Contrary to what Klaus wanted to believe, Hayley was more than just a "liquor-fueled one night stand." A lot more. A whole lot more. She's the mother of his unborn child! Wait, that requires capital letters: HAYLEY IS THE MOTHER OF KLAUS' UNBORN CHILD!!! Holy. Plot. Twist. My jaw remains sore from how hard it fell to the floor upon that bombshell being dropped, but it makes perfect sense: Plec is trying to build a show around a villain. And, yes, the whole anti-hero thing has been in vogue for awhile now (Hi, Tony Soprano. How's it going, Walter White?). But Klaus isn't just any villain. He is the villain. He is the Original Hybrid, as he loves to remind people, and he just murdered Tyler's mother in cold, innocent blood a few months ago. Plec needed a way to soften Klaus, to tear down that evil facade (okay, it's a lot more than just a facade) and to bring out his vulnerability. Enter parenthood, right? 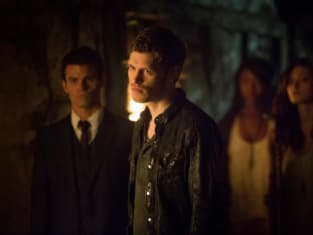 Enter tears, profound realizations and and entirely new Klaus, right? Nope. This isn't actually Parenthood. Klaus won't be swayed that easily, no matter how many intense pep talks he's given by an impeccably dressed Elijah. But power? Control? Heck, mere company, for someone who is alone and hates it? Bring all that on and more, especially when he feels it's been taken by his one-time protege. Klaus has always been fueled by revenge. Just ask Tyler. So, yes, he'll stay in New Orleans. He isn't sure where to find the keys to this kingdom - what, exactly, is enabling Marcel to control the witches so easily? And is that why they need to conduct a covert plan instead of simply killing him? - but now he's invested in finding the answer and taking the throne. As for the baby? Unless his name is Joffrey, every king needs an heir. And every show could use a Joseph Morgan. A mesmerizing performer, we've watched for multiple seasons now how well he can play angry... and hurt... and vulnerable and funny and sarcastic. But every emotion was truly on full display here. Take note of the scene on the street, in front of the artist, listening to Camille talk about demons and how they can either control you or you can control them. We were treated to utter silence from Morgan. Just a glazed over look that turned teary-eyed and a few jumbled words. I think you had it right the first time. Morgan is a terrific actor, a leading man in every sense of the concept and his talent alone should be enough of a reason to tune in for The Originals. Because, let's face it: The CW will pick up this series. It will be a part of the fall schedule. Ignoring the lack of other strong options for the network, there is plenty here to make into a fascinating drama. With Klaus, Elijah and Rebekah, we have three established TVD favorites. With the pregnancy storyline, we have a whopper of an ongoing arc. With Marcel, we have an intriguing new antagonist. With Camille (sorry, Cammy), we have the obligatory human lead, though it seems clear right away that this one won't be nearly as naive or innocent as Elena upon her introduction. With supernaturals actually running amok in The Big Easy - vampires in control, werewolves pushed to the perimeter, witches forced to follow rules - we have a different set up than in Mystic Falls. With the history between characters and families, we have the potential for flashbacks galore. And with New Orleans, we have jazz! And gumbo! And no open container laws! Seriously, it's an awesome city. So that's it. I change my vote. I'm on board. How about you? What did you think of this special episode? And are you excited for The Originals?